My partner and dear friend Kathleen “Kappa” Horn and her brother, Raymond Horn, started the business in 2002. If fact, the pictures in the main dining rooming are her family photos. 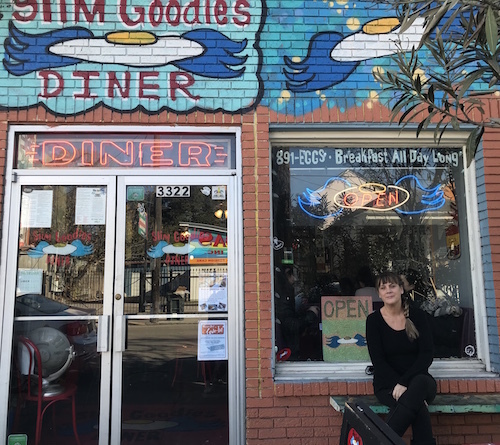 Kappa owned a retail shop in the French Quarter and decided to open Slim Goodies Diner to bring the American-Creole breakfast “Diner” concept to Uptown. I have always been in the service industry and previously was the general manager of an iconic, local restaurant. Two years ago, around the time Kappa was getting ready to sell Slim Goodies, I decided it was my time to own a business. I didn’t want to do it for other people anymore; I wanted to do it for me. Taking over Slim Goodies was a natural transition since I had helped Kappa to set up the restaurant in 2002. I bought into the business in May 2015 and moved everything I could possibly move to the ends of the earth to do it! How did Kappa come up with the name “Slim Goodies”? Kappa and her sister were walking down Iberville Street in the French Quarter when a gentleman in a head-to-toe purple polyester suit with a matching Fedora, smoking a long skinny cigarette, called out to them from a doorway, “Hey slim goodies!” It was an inside joke, and when Kappa went to open the restaurant, “Slim Goodies” just stuck. Just that: New Orleans. We have that Southern hospitality and an understanding of the culture, traditions, and cuisine here. I believe each city brings a unique quality to their small businesses. In New Orleans, we’re warm, we’re friendly, we’re inviting, and we’re a little bit different—there is no cookie-cutter business here. We get everyone. The local neighbors and out-of-town visitors have been coming to us for the past 15 years. Your customer base is built on what people say about you, and success is when people talk about you in a kind way. Every person who comes in either to work or to eat Slim Goodies is considered a guest. The French 75 for sure! The combination was said to have such a kick that it felt like being shelled with the powerful French 75mm field gun. The same applies to what we do here. All of our dishes pack a powerful punch, whether it’s a twist on a classic breakfast item or an original Slim Goodies creation. We’re quirky, different, and a little funky. Slim Goodies combines the Southern, the Louisiana, and the New Orleans culture with French, Spanish, and other international infusions in to a truly unique business. Survival. When you live in a place that is prone to natural disasters and you’re a small business, you have to dig your heels in and survive—be the first to open and the last to close. There are only two days a year when the restaurant is closed: Christmas day and Mardi Gras day. Otherwise, I don’t close the restaurant for any reason. Being open no matter what changes how people see your business because they know you’re here for them. It’s an important sentiment to build in your business and community. Happy guests, good service, consistent food, and an atmosphere of enjoyment. We also do a lot of mentoring of the younger generation because we want them to understand the simplicity of hard work and the gains it provides. That’s hard to say; this area supports such an amazing culture of services. You can have breakfast, get a haircut, find an outfit, buy a gift, have lunch, rent a property, get some seafood and a tattoo, and have your car fixed and then have dinner all in one block. I would be selling short every business in this area to pick a favorite. It’s New Orleans, there are a thousand fabulous places! The small businesses that I think are a mainstay of the culture here are amazing and I’m also always trying new places. Stay the course. The front cover of our menu says, “We’re here to stay & stand by New Orleans, come hell or high water.” It really speaks to what we do. It’s not about making money, it’s about what Slim Goodies Diner brings to our community.